This offseason will be plenty busy for the Dodgers. Even after winning 92 games for the second consecutive season, there promises to be more of the front office influence in the 2016 roster. Player personnel-wise (because the coaching staff is a different animal in itself), the front office will need to make decisions on the Dodgers’ pending free agents like Zack Greinke, Howie Kendrick, Brett Anderson and the arbitration-eligible guys like A.J. Ellis and Juan Nicasio. It’ll have to figure out how to construct the bullpen. There are some good pieces down there outside of Kenley Jansen (Luis Avilan, Yimi Garcia, Chris Hatcher) and some guys who could go either way (Pedro Baez, J.P. Howell, Joel Peralta). But perhaps the biggest situation that needs attenion is the outfield. The starting rotation will figure itself out with money and/or trades. It always does. The Dodgers’ outfield needs to be settled at some point. Mainly, this means moving a guy like Carl Crawford and/or Andre Ethier, making a decision on Yasiel Puig and making sure Joc Pederson is in a position to succeed. Yes, Jason Heyward. He’s my top free-agent target for the Dodgers — even ahead of guys like Greinke, David Price and Johnny Cueto. Heyward is a difference-making player who would help stabilize the Dodger outfield. Let’s take a deeper look at him. The first thing that should stand out is his age. He turned 26 in August. Guys who are entering their age-26 seasons don’t hit the open market with regularity — especially those who are as good as Heyward is. He’s coming off a 6-win season (the second of his career) and has been worth more than 4.5 wins per season in his young career. Secondly, he’s an elite defender. He’s the best right fielder in baseball by a wide margin and can even play a capable center field. Problem is, the Dodgers have Puig and Pederson at those spots, respectively, so one of them would have to change position (or team). I’m guessing it’d be Puig (on both fronts). His arm would be somewhat wasted in left field, but if it means upgrading the overall outfield defense, the sobeit. I’ll say this: If Heyward is signed, I’d increase the odds of Puig getting traded (for a youngish starting pitcher) substantially. Third, he’s a great base runner. He had a 7.0 BsR, which lead the majors. We have written a lot here about the Dodgers’ base running woes in 2015, and it (admittedly) got better when Ron Roenicke replaced Lorenzo Bundy. Bringing Heyward into the fold would go a long way to fixing the poor BsR the Dodgers posted this past season. He also stole 23 bases, which would have easily led the Dodgers. Fourth, he’s a good hitter. His wRC+ was 121 — 21 percent better than league-average. People will point to his 13 home runs and say, “What’s so special about that?” But he did have a slightly better than league-average isolated power (.146), walked almost 10 percent of the time and struck out just 14.8 percent of the time. He also had the fourth-best contact rate in baseball at 84.2 percent. For context, Justin Turner had the best contact rate of any Dodger at 84.4 percent. 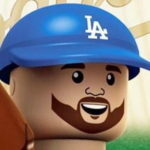 In the outfield, Ethier had an 81.4 percent rate, followed by Crawford at 78.6 percent, Puig at 74 percent, Van Slyke at 72.6 percent and Pederson at a woeful 66.8 percent. The bottom line is, the Dodgers didn’t make enough contact as a team (78 percent, 21st in the majors). He also spreads the ball around the field and isn’t just a pull-hitter by any means. 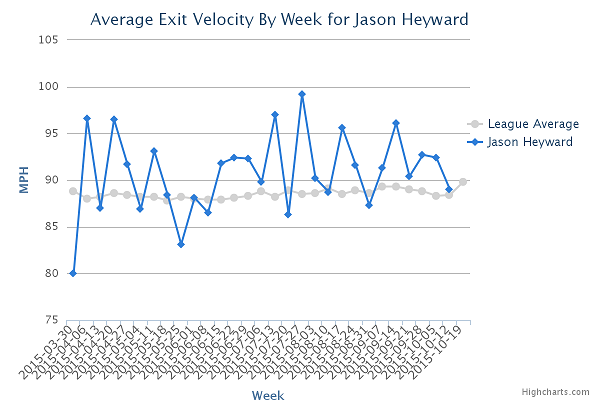 Heyward’s contact-oriented approach comes with some pop and strong exit velocity. Fifth, everything is trending in the right direction for him. Since 2012, his contact rate, outside the zone swing percentage, zone contact rate, and swinging strike rate are all getting better. His swinging strike rate was 6.5 percent — fourth-lowest in the majors. He also hit a career-best 57.2 percent of the pitches he contacted on the ground, allowing him to use his above-average speed to leg out hits and take extra bases. When you have a team that doesn’t make as much contact, having a guy like Heyward could not only improve the rate all-around, he also could influence guys to change their ways slightly. I’m not saying Pederson’s contact rate would jump 20 percent if Heyward were signed, but perhaps he wouldn’t try to hit the ball as hard and far as he can in every plate appearance. Heyward is the perfect package and the exact type of player this front office would adore. Having said all of that, I’m not going to sugarcoat this: He’s going to cost a ton of money. An 8-10 year deal at $25 million-plus per season not only isn’t out of the question, it should be expected at this point. I’m not sure the Cardinals would make that kind of commitment to any player, let alone Heyward. I’m guessing the Dodgers’ main competition for Heyward’s services would be the Cubs, as they employ a similar philosophy on players and how to value them. Obviously, the player has to want to come to Los Angeles. I’m sure $200-plus million would be enough to coax him, but you never know. Signing Heyward should be the Dodgers’ top offseason priority. He’s just the type of player this team needs. The fact that he’s only 26 years old is a huge bonus for a team that has the potential to get pretty old, pretty quickly.